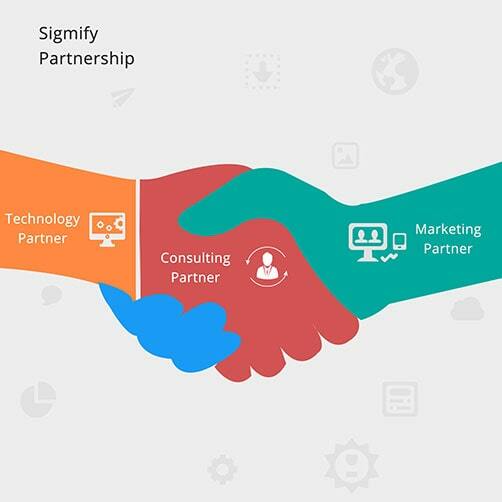 Sigmify strives to create mutually beneficial partner relationships. With complete commitment to empower our partners with our capabilities and effective solutions. What can be expected from our partner programs? We are totally committed to understanding our partners, their business and their industry. And creating symbiotic partnerships to enrich us as well as the partners. Sigmify is a result of a decade of experience in implementing business process management solutions across the globe. With rich technological features to boost the most critical productivity factors in an organization, Sigmify hopes to reach out to companies spread across the world. How does Sigmify create an impact? Sigmify products have evolved to being highly effective owing to over 2 years of research and innovation. The primary understanding that every partner has a different identity has spurned us to integrate Sigmify into the partner programs strategically. Sigmify focuses on the fine tuning of all its products to implement dynamic strategies, as required in today’s fast paced business environment. What is the impact? Sigmify is a platform that uses automation as a fundamental principle. However, the automation has been very creatively been designed to accommodate changing business scenarios. The bottomline is always in sight. Hence, our partners are enabled to deliver value to their clients incrementally. Sigmify is looking for partnerships with hardware, database and technology organisations.Our products are designed to seamlessly integrate with the technology partner’s expertise and create enriched relationships with a larger customer base. We specialize in increasing the scope of business process automation on existing technology platforms, thereby creating a symbiotic working environment with our technology partners. Sigmify was not designed as a one-size-fit-all product. We are keen to cater to all types of industries with the help of consulting partners. Sigmify seeks partners with functional expertise and domain knowledge to create cost effective & efficient tools for all types of verticals. The consulting partners will get an understanding of the rich features of our products, helping them in offering local support for Sigmify products across the world. Their expertise will help mould Sigmify as per the exact customer needs in their area of expertise and help customers deploy our innovative offerings in the best possible way. The customers can derive great value from this relationship which will take care of the working as well as the bottomline. Sigmify is an innovative tool, born out of a decade of experience in the business process automation and the vision to create scope for better results. We need passionate marketing partners who have geographical presence and high familiarity with the technological domain. What we strive to create is a truly symbiotic relationship to benefit Sigmify as well as the marketing partners. Marketing partners with a significant reach in various verticals can enhance the value of their offerings by integrating with Sigmify and transforming these offerings into end-to-end solutions. Sigmify is all about creating value, enriching customer relationships and impacting the bottomline.